They Started School Afraid of the Water. Now They Are Saving Lives. | The New York Times Equipped with its own working swimming pool, a rare commodity today in New York City public high schools, Grover Cleveland offers lifeguarding classes that lead to Red Cross certification. Down at the deep end of Grover Cleveland High School’s aging four-lane pool, two students lie face down in the water, unresponsive. “O.K., get them,” barked a swim teacher, and a group of chatty teenagers in swimsuits went into rescue mode and leapt into the water. They hooked the “drowning” students — playing victims for a lifesaving drill — around the shoulders to swim them to safety. “Don’t let them go, never let them go,” yelled the teacher, Chris Sullivan, 44, as the students slid a flat wooden backboard into the water to ease one of the struggling swimmers out. This was the scene the other day at one of the popular lifeguard training classes at Grover Cleveland, in Ridgewood, Queens — a high school that may not get the public recognition the city’s more prestigious schools enjoy, but that has the distinction of being one of the largest feeders of young lifeguards in New York City. 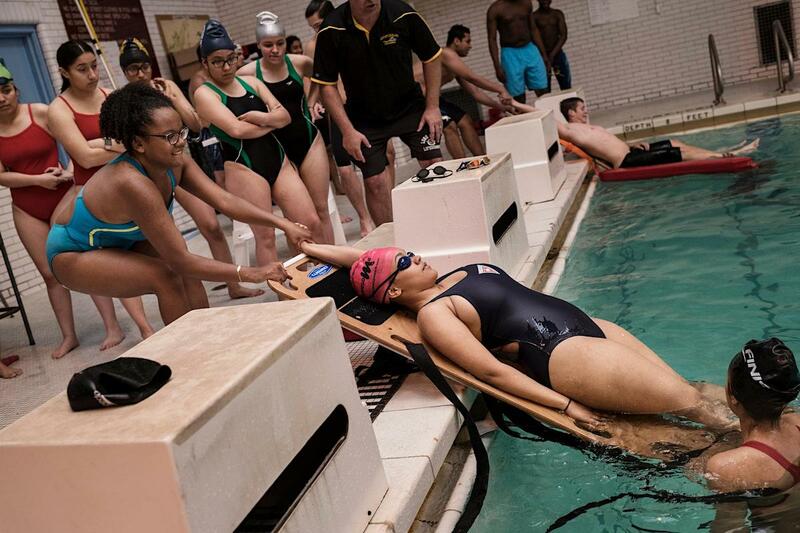 Equipped with its own working swimming pool, a rare commodity today in New York City public high schools, Grover Cleveland offers lifeguarding classes that lead to Red Cross certification. Dozens of its students obtain lifeguard jobs every spring and go on to work at city beaches and pools — a remarkable feat, given that most of the students are from neighborhoods not known for turning out swimmers. Yet, the school has produced more than 300 working lifeguards in the past decade, Mr. Sullivan said.